A flower with bright yellow petals surrounded by similar flowers that have lost their pedals and are dying. 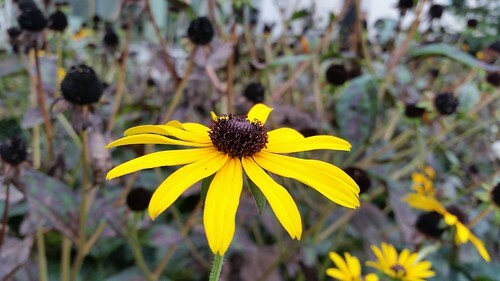 In some ways, to reach this stage of fall, wherein the flower is still shining bright with color, while its brethren are solely black bulbs, tends to imply that this fellow as a late bloomer. It took its merry time to get to full blossom, while the other flowers were shining bright, but now as the others have died, this flower gets to shine. I find connection with this late-bloomer as that was much of what my adolescence was marked by--late blooming, physically, emotionally, and mentally. But that would be the lesson I would tell other late bloomers in their life-journeys--it just means the best is yet to come.